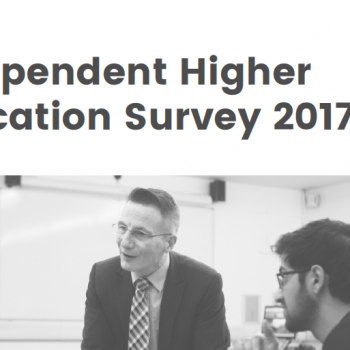 The first survey of independent providers of higher education since 2014 suggests that regardless of size, specialism or mission, independent providers are positive about the changes to be implemented as part of the Higher Education and Research Act. The survey of 111 independent providers shows that the sector has not changed substantially since 2014, with providers remaining far smaller than their publicly funded counterparts, still industry focused, and delivering in specialist programmes through alternative models to the traditional three or four year undergraduate degree. The report provides insight into the shape and scale of the sector, and highlights where independent providers feel they will develop over the next five years. 55% are confident that the Higher Education and Research Act will create a better higher education system for their institution, and 64% plan to register with the Office for Students at either the Basic, Approved or Approved (fee cap) levels. 34% of those responding remained unsure what level they would enter but only 3% said they would not register with the Office for Students. The majority of independent providers want to see the government address the different funding models across tertiary education with 50% supporting a single funding system across further and higher education, almost 60% supporting a funding model based on academic credit instead of academic year, and over 60% supporting a change in funding to support accelerated degrees. Over 90% of those responding to the survey expected their UK student numbers would grow or stay the same, however 30% felt their EU student numbers would decline in the next year. 22% of independent providers in the survey plan to apply for full Taught Degree Awarding Powers (TDAP) before 2020, and 22% are also considering single subject or level TDAPs. 73% of responding providers teach 1000 students or less across all programmes. 57% of students at responding providers are from the UK, 17% are from the EU and 26% are from outside the EU. 50% of the independent providers who responded offer part-time and flexible learning, 40% offer online, distance and blended learning opportunities, 16% offer accelerated degree programmes and 10% offer apprenticeships. Responses to the survey came from those already designated for student support by the Department for Education (66%) or with a Tier 4 licence to teach international students (49%) as well as those not yet in regulation. The survey reached both members and non-members of Independent HE, with the report showing that members of Independent HE are twice as likely as non-members to have definitive responses to questions on changing regulation.